Good morning, friends, and welcome to the Thursday edition of Kentucky Sports Radio, which is coming to you from the Academy Sports and Outdoors in Louisville (4901 Outer Loop Drive) on Day 1 of the KSR Summer Tour. Come on out to enjoy the show and hear Matt and the gang discuss last night’s draft decisions, the latest on Stanford grad transfer Reid Travis, and much, much more. Glad about PJ. Sad about Wenyen. Meh about Jarred. He was quite a rebounder, but all the “I’m ready to play, I’m not playing, I’m not injured, actually I am” drama is the second thing I’ll remember him for. Hope we get Travis to put the finishing touches on this team. Yep, we have 3 paint players; hope we can get Travis, we’re a little thin. But I don’t count chickens til they hatch. True, Chris. If he can get healthy and find his shot, he can be really good at the next level. I worry about Vanderbilt listening to the wrong people. He is very talented, but I worry that those around him don’t have his best interests at heart. This actually worked out for the best, I think. If Vanderbilt did come back, who’s to say it wouldn’t just be a repeat of last year for him. But he really has the “it” factor, if he can just get healthy. PJ was the one the team needed the most, and I’m a little sad to see WG leaving for wherever he ends up. I’m sad to see Wenyen leave because I really like the kid. He’s such a ray of sunshine. Yup, contagious smile; really hope he comes back to get the degree. Glad we have PJ coming back, and hope we get that grad transfer, but I will have to be convinced that we are a legitimate FF contender by some stellar play in the early season to get at all excited about this team. Another year with no upperclassmen – ugh. It’s becoming a trend, unfortunately, and I think Cal is going to have to figure out a way to get some kids to hang around if he really wants a shot at #9. Five man. Count ’em five. We lost five from a team that only made the Sweet 16. And who knows how close PJ came? We need the Stanford dude. Agree. Though Wenyen and Terrence Jones don’t have similar play styles, I think Wenyen can be that type of leader and bring that energy for a championship squad. P.J. Washington actually reminds me a lot of Terrence Jones. Liberty, where my mom is from (farm girl) and where we used to go to visit my grandparents and one of my aunts and her fam. We loved playing in that old barn on my grandparents farm. 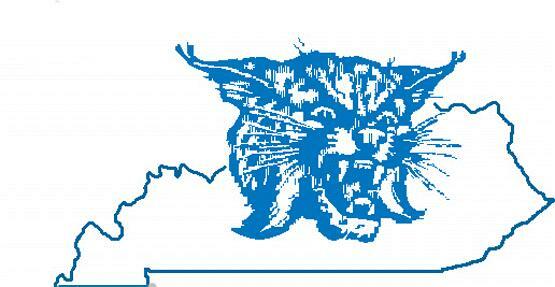 Not to scream, but another memory I have, after leaving Kentucky actually, is that when we would visit and drive from Lexington to Liberty, there was always this one house that had a big white satellite dish in the back yard, and it has a blue Wildcat logo painted in it. It was ULTRA cool and I wanted it, even if only for decoration and to show my blue!!! My computer forbade me to view your image. Sigh. I miss the old school Wildcat logo. Hard to believe we lost 5 from a team that lost to a mediocre team in the tournament. Only Knox will see meaningful minutes in the League. Great minds think alike. But I don’t know near as many of them fancy 10 dollar words as you do. I think Shai will be good. He has the skills and the size and is a very hard worker. Agree with J Dub. Shai has the tools to be a really solid player in the league. I doubt he’ll ever be a super star though. Knox needs to be more aggressive as a player, but that will probably come with age. He’s very young, and maybe a little too nice. I could easily see Shai being a starter in the NBA. This may sound crazy, but I think Hami will do better in the NBA than people think he will (kind of like Skal). He’ll have more freedom of movement. All those times he got called for bogus charges won’t happen in the league, they’ll just let him dunk on on people’s faces because it puts butts in seats. Hami will have to learn to play D if he ever wants to see the floor in the NBA. And his lack of ability to consistently knock down open shots will be a big problem for him. Maybe he fixes that, though. According to our coaching staff Hami is a hard worker, so I think he’ll get there. Hami showed a couple flashes, this season, of the defensive player he’s capable of becoming. I guess technically, Jarred’s entourage was right. He played, he got hurt again, and now his future status is in question. It reminds me of Sam Bowie. No team is going to take the chance that Portland did. Not trying to be mean, but if you can’t hang with college kids without getting injured, do you really think you can play with grown men and stay healthy? Best of luck to the kid, he’s going to need it. And it’s double the workload in the nba more games more workouts no breaks and when someone is paying for your services you don’t get to sit. If doctors clear you then you must work! Today is National “Speak in complete sentences” day. That’s everyday for me. I am one of those jerks who texts in complete sentences with proper punctuation and everything. I text and tweet in complete sentences, except when I’m, texting my husband, which can be borderline gibberish, but I know he can figure out what I mean. Dem rulz from RG do. JK! So your husband can translate the gibberish that shows up on the KSR comment sections after a loss…some of it makes my head hurt. Nah, no one can make sense of that stuff. My teenage daughter actually thinks it’s kind of offensive when I end a sentence in a text with any punctuation at all. I’m ok with leaving those open ended, but questions with no question mark still don’t look right to me. That’s a big one, RCF! Best wishes to you in this time of stress. I can read that RCF, but it makes my brain hurt. RCF, don’t forget to have the passenger side brakes installed before she gets behind the wheel. Ppl who don’t use punctuation, especially in a long paragraph, should be banned from having a computer or any other device that allows commenting. Mix in a period! Clutch, are you serious? That’s so weird. The basketball program does a video feature on each player, with interviews, every season. Last year they made a podcast version that wasn’t as good. Twitter is a haven for a**holes. Twitter also has some very special content. Like the Laurel/Yanny style video that says what do you hear, Louisville or Cardinals? Then you press play and it’s a voice saying “Garbage”. In all seriousness, it is a fabulous way to watch games and converse with like minded people, and to get up to the minute sports news. I have Twitter only to follow a handful of people or organizations. During the winter it is the absolute fastest way to find out about school closings. In about 2 years of having an account, I have still not tweeted anything at all. It’s fun, and you can mute trolls. Yeah, but it works both ways; Dan Dakich muted me…he has no sense of humor at all. Just not confident about Travis. Both Duke and ‘Nova have a spot for him; and, he originally considered Duke coming out of HS. Hot Take: I don’t think Villanova will be very good next season. They are losing 4 of their top 6 players and Jay Wright takes time to build teams and implement his system. Sadly, I don’t get the feeling that Archie Miller will be nearly as easy to make fun of as Crean was – and Davis before him. Maybe he will sweat like a pig the way his brother does. Agree, why expose ourselves to their cooties? Did you see the article about Crean? He’s going to get all of Cal’s recruits…oh no. Ashton Hagans seems to indicate otherwise. I guess he just spotted us Ashton Hagans to make it fair. Hahaha! Give me IU over anybody. I live in Southern Indiana, grew up in Louisville, and for a large chunk of my life that was/is the game I most look forward too. Plus they’ll be better than UL for the foreseeable future. I was also one of the few UK fans at the game the last time we played at IU, so I’m scarred for life. I’d still be in favor of going back. I’d like to see home/home/neutral rotation. Let me know when IU is relevant again, but I really don’t feel like playing them until then. I agree, and if IU gets decent, you can bet we will get them in the tournament. No, I was up a little too high to get trampled. But I have plenty of good stories about that day. All the harassment stories you hear are true though, I can promise you that. And IU will be top 25 next year, so that’s relevant enough. NBA finals are stale. Reminds me of women’s college basketball when it was UConn winning it every year. We need to break up the Warriors Death Star to make things interesting again. Matt is right about flying on those small planes. The scariest plane ride I had was on a little puddle jumper from Louisville to Cinci. We were flying out of a heavy thunderstorm and the plane started yawing. I can handle the up and down roller coaster, but when the damned thing starts going side to side like it wants to swap ends I get nervous.